This methi aloo paratha recipe is a one of the healthy ways to add greens to your diet. This is a good dish to have it for breakfast lunch or dinner. It is also a good one to pack and take in the lunch box. You may also add it to the picnic basket as it can be served cold too. Methi aloo paratha is a easy recipe. If you like parathas you will love this one. Methi aloo paratha can be served with any curry, pickle, chutney, butter or ghee or yogurt. 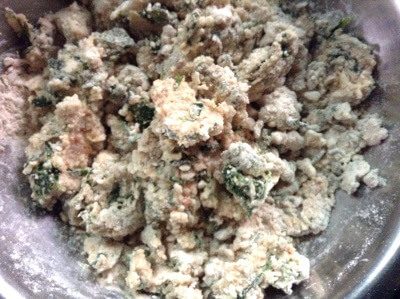 Though this looks similar to methi paratha, it is softer than that. Methi here refers to is fresh fenugreek leaves. You may use canned fenugreek leaves if you cannot get fresh ones. For this recipe, we use only the green leaves of fenugreek plant. We do not use the stems. You may use the stems in your dal or along with another subji. How to make fenugreek leaves and potato flat bread - Methi Aloo Paratha? 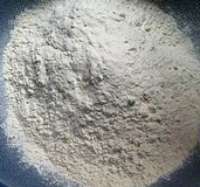 Whole wheat flour -2 cups. 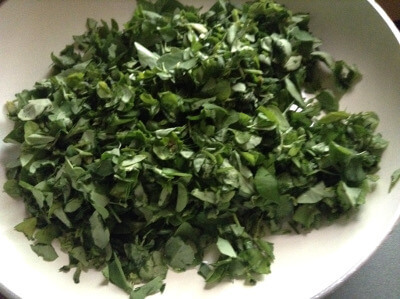 Fresh methi(fenugreek) leaves - 1 cup. Oil or melted butter - 2 tbsp. green chili paste - 1/2 tsp, if you like extra hotness. 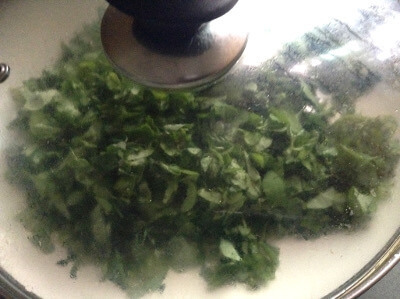 Clean the methi leaves by washing them in a bowlful of water and then put in a colander. Hold the colander under running water and then wash using your fingers. Keep aside to drain. In a heated pan, add 1 tsp oil. Add the chopped methi leaves. Mix and cover with a lid. 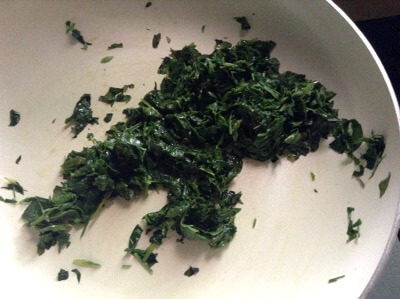 This is is how the methi leaves look after cooking. 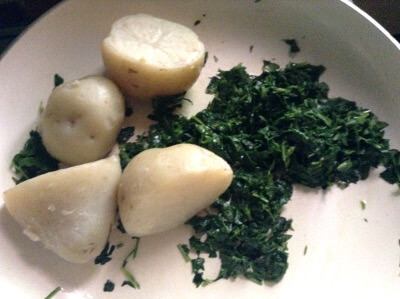 Peel boiled potatoes and mash them. 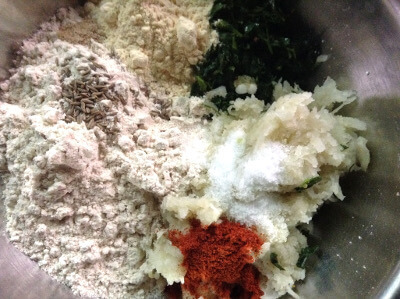 Add whole wheat flour, salt, finely mashed potato, chopped methi (fenugreek) leaves, red chili powder, cumin/jeera seeds, oil or butter to a bowl. Add water little by little and form dough. Do not add too much water. Let it be a little tight. Knead well, Cover and leave aside for 20-30 minutes. After that knead again and then make 6 round balls. Take each ball, dip in dry flour. Sprinkle a little flour on the board. Place the dough ball on it and roll out into a thick round of about 4-6 inches. Heat girdle - tava - skillet. After it is heated well, turn heat to medium. Put the paratha round on the tava. Cook for 5-8 seconds. Turn again. Sprinkle a little oil or butter or ghee. Cook on both the sides adding a little oil or melted butter if you wish. Both the sides should have brown spots on them. Apply a little ghee or butter on top if you wish. Serve hot by itself or with any curry, pickle and yogurt or tomato ketchup . I usually grate the boiled and cooled potato. Then it is easier to mash without lumps. You can make the dough and keep in the fridge for 2-3 days and quickly make parathas as and when you want. You can add garam masala , til(sesame seeds), jeera powder(cumin powder), grated onion for variation to this recipe. Adding oil while cooking is optional. Keep parathas covered till serving time. This will keep them soft. Palak Paratha - Spinach leaves and Whole wheat flour flat bread.